These are some of the cute flowers I have made using the Blossom Punch, the Mixed Bunch Stamp Set and various brads for the centres. 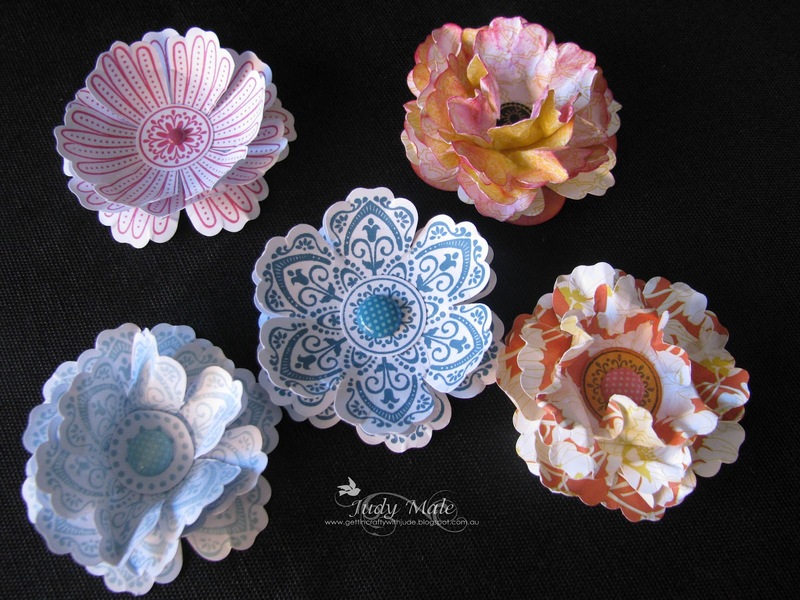 You could use them to adorn all sorts of projects, whether it be cards, scrapbook pages, or even on a gift box. I have had lots of fun with these! 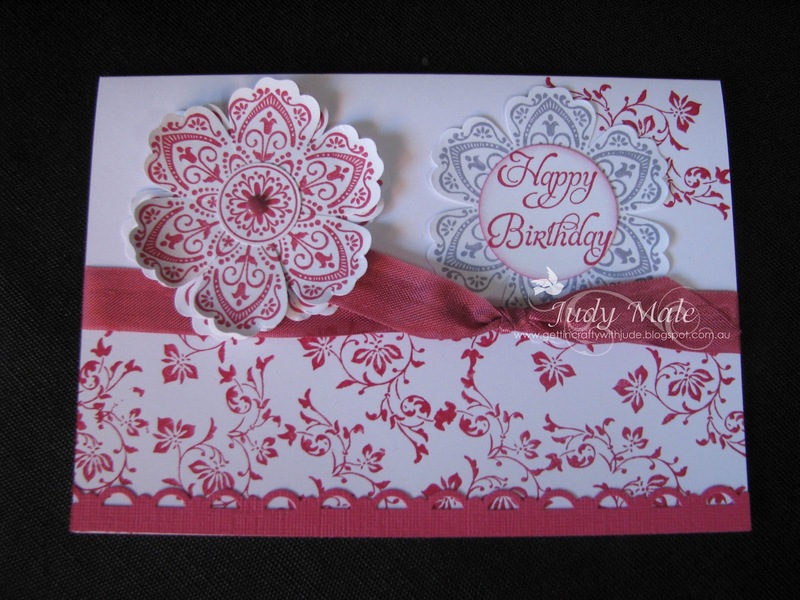 This card uses the Vintage Vogue and Mixed Bunch stamp sets, Scallop Trim Border and Blossom Punches, a Rose Red Brad, Circle Punch, the sentiment is from the Saleabration Hostess stamp set called Elementary Elegance and Rose Red Seam Binding Ribbon and Classic Ink. 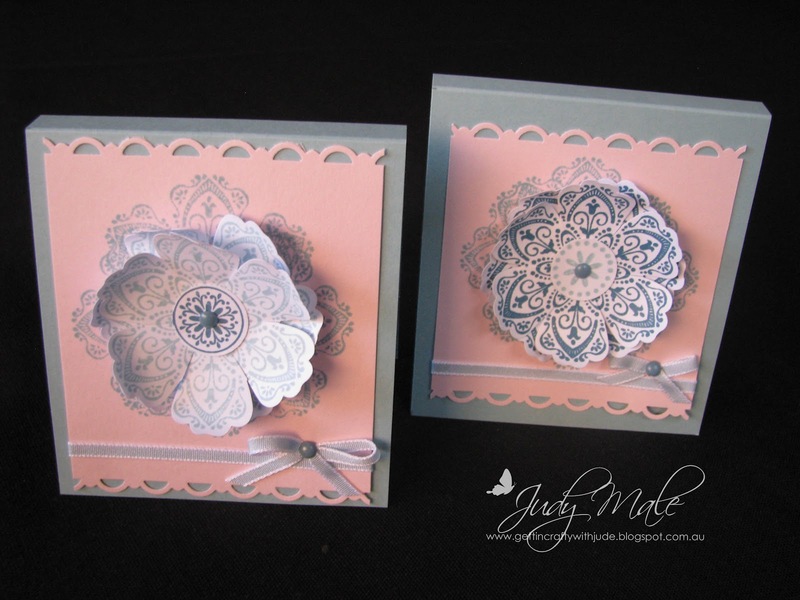 A couple of Post It Note Holders using Pink Pirouette and Baja Breeze Cardstock, the Scallop Trim Border Punch once again, and of course the Mixed Bunch Stamp Set and the Blossom Punch, some taffeta Baja Breeze Ribbon and Brads. Classic Inks I used are Baja Breeze and Island Indigo. 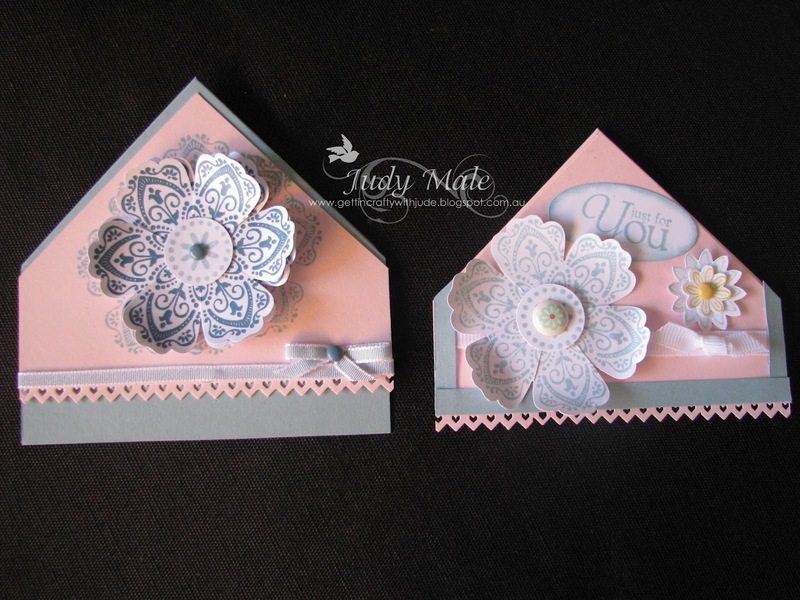 These are my bookmarkers using most of the above products, but I have used the Pinking Hearts Border Punch,a couple of the Boho Blossom Punches, the little flower stamps are from Language of Friendship and some White grosgrain ribbon on one of them . These are quite fun to make! Now this card uses our adorning accent embossing folders (the strip of tiny hearts) the embossed border for the edgelit, the adorning accent edgelit die from the Autumn/Winter Mini Catalogue, White satin ribbon, Pool Party Brads, Baja Breeze and Whisper White cardstock, classic inks in Pool Party and Island Indigo and a sentiment from Happiest Birthday Wishes. 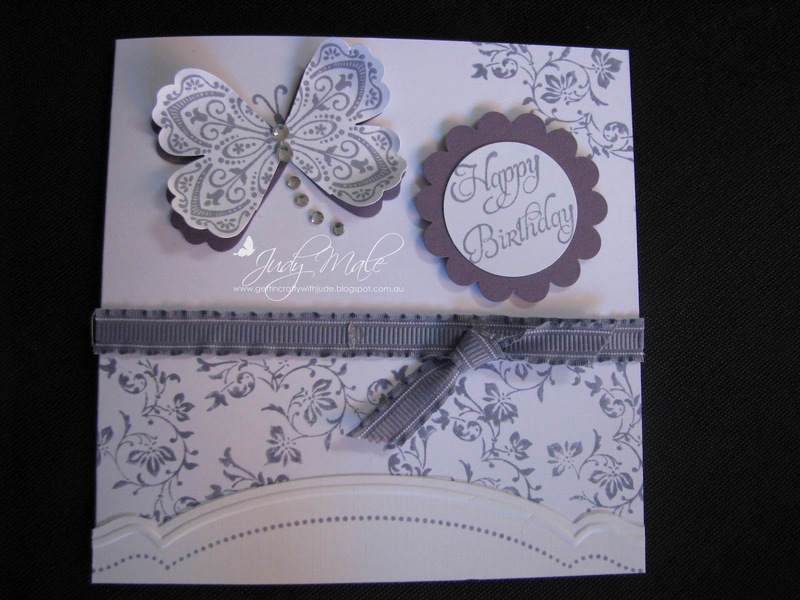 A bit of a twist this time, cutting out a couple of sections of the Blossom Punch which was stamped with the Mixed Bunch stamp set and we have a pretty butterfly! 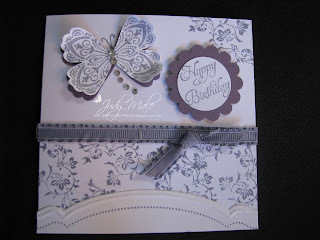 I have used the Vintage Vogue stamp set for the backround, classic ink is Wisteria Wonder and also the ribbon is Wisteria Wonder. 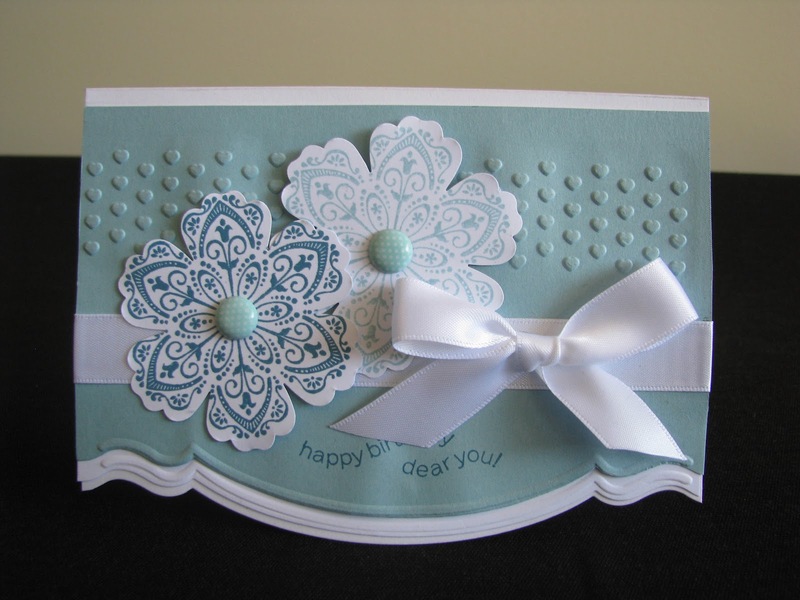 The Edgelit Die and Adorning Accent Textured Impressions Embossing Folder. 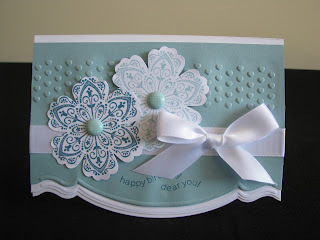 There is also a row of dots which is from the Bordering Romance stamp set, Scallop Circle and Circle Punches. I used some Rhinestones to add to the butterfly to dress it up a little and give it some bling! I do love this card, I saw something similar and have cased it with my version. Sorry, I don't remember where I saw it from originally though. This time I have used Calypso Coral cardstock for the vase which is one of the Framelits with the bottom cut off, and then I ran it through the Bigshot in the Perfect Polka Dots Embossing Folder. The Brads are incolour brads in Calypso Coral. Pear Pizzazz cardstock for the backing, Whisper White and Pretty in Pink Card for one of the flowers. 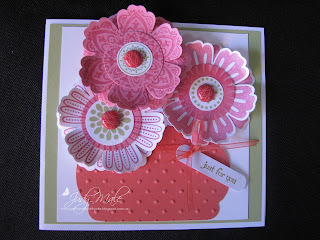 Pretty in Pink and Pear Pizzazz Classic Inks. Calypso Coral Ribbon from the saleabration hostess gift set and sentiment from Teeny Tiny Sentiments. As you can see, I have had loads of fun using the Blossom Punch and Mixed Bunch Stamp set. 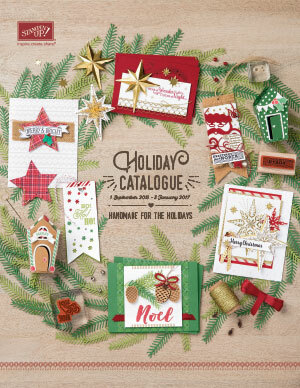 If you don't have a copy of the Autumn/Winter Mini, then just click on the photo that's on this blog page and follow the link. If you would like me to show you how to make any of these projects, then give me a call and I will be happy to give you a demonstration.